January 28, 2014 | Lens cap....off! For most of the day I thought it was tomorrow. And so when I learned tomorrow’s yesterday was, in fact, today…I was rather disappointed. It was a day full of disappointments. I’m disappointed that there aren’t less work hours in the day (well, I suppose there could be but there’s that strong work ethic thing that annoyingly gets in the way). I’m disappointed that my first real opportunity to relax comes at nearly 10 o’clock at night. I’m disappointed that I’m still complaining…because it feels like that’s what I’ve been doing for the past 2 days. Allow me to complain about one last thing. 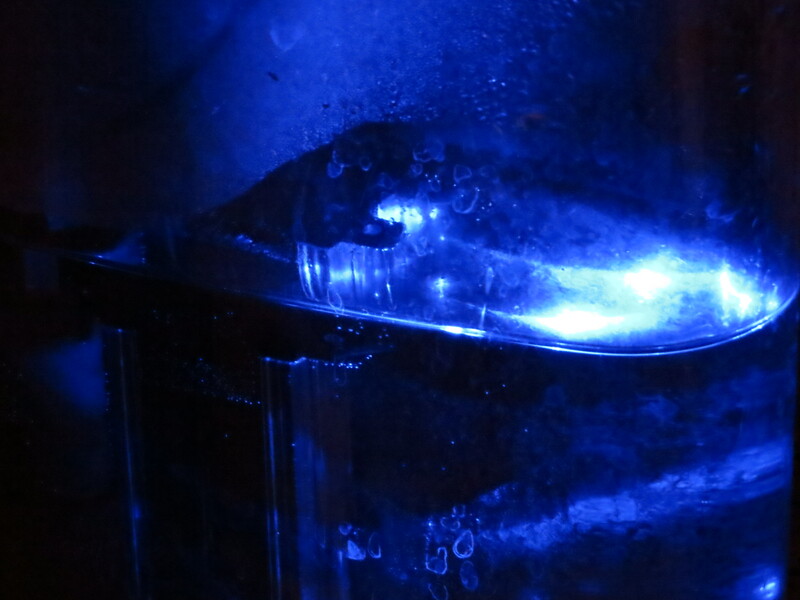 My coffee maker has this pretty blue light. It looks serene. But I wonder, was it specifically designed that way to endear the coffee maker to the owners? The idea would be to build this associated sense of well being within the product so that one wouldn’t mind spending 13 bucks on a box of little coffee filled cups…and I could totally see someone doing that. Crafty bastards. I have no idea why I’m even considering this. But I like this light. For the briefest of moments it makes me forget that I’m annoyed and disappointed. And I thought I’d try to capture it, looking sneaky and serene. So click click click with the nighttime setting on my camera. All I really notice is the fact that I need to clean my coffee maker. Disappointment ensues. In desperate need of a thorough washing, apparently.